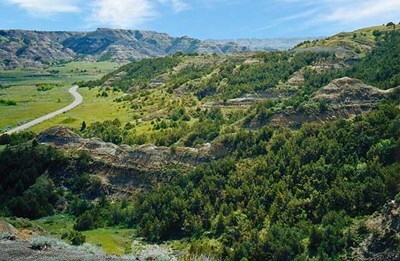 Theodore Roosevelt National Park is a United States National Park comprising three geographically separated areas of badlands in western North Dakota. The park was named for U.S. President Theodore Roosevelt, in honor of his achievements in conservation as president and for the landscape's influence on his life. The park covers 110 square miles (285 km²) of land in three sections: the North Unit, the South Unit, and the Elkhorn Ranch Unit. Fort Mandan was the name of the encampment at which the Lewis and Clark Expedition wintered in 1804-1805. The encampment was located on the Missouri River approximately twelve miles from Washburn, North Dakota, though the precise location is not known for certain and may be under the nearby river. The fort was built of cottonwood lumber cut from the riverbanks. It was triangular in shape, with high walls on all sides and a gate facing the riverbank. Bonanzaville, USA is a history museum complex in West Fargo, North Dakota. Bonanzaville, the museum of the Cass County Historical Society, is made up of forty-seven buildings on 12 acres (49,000 m), many of them are historic and from the region. These buildings have been moved to the museum grounds and now form a village setting. Most of the buildings have a special theme. Displays include a prairie church, a general store, a drug store, a fire station, a jail, and a schoolhouse. Fort Abraham Lincoln State Park is located seven miles (11 km) south of Mandan, North Dakota. The park is home to On-A-Slant Indian Village, the blockhouses and the Custer house. President Theodore Roosevelt signed the deed to the land to the state in 1907 as Fort Abraham Lincoln State Park. The Dakota Dinosaur Museum is a dinosaur museum located in Dickinson, North Dakota, USA. The museum was first proposed in 1987 and it opened in 1994. The 13,400-square-foot (1,240 m) museum is run by volunteers. The museum contains dinosaur replicas that were made by a company in Utah together with artists from Texas and North Dakota. Most of the artifacts in the museum were donated by Larry and Alice League. The museum is open from May to Labor Day. Medora is a city in Billings County, North Dakota in the United States. It is the county seat of Billings County. The population was 100 at the 2000 census. It is part of the Dickinson Micropolitan Statistical Area. Medora was founded in 1883 by French nobleman Marquis de Mores who named the city after his wife Medora von Hoffman. Marquis de Mores wanted to ship refrigerated meat to Chicago via the railroad. Devils Lake State Park is the name applied to the two state parks located in Ramsey County, North Dakota located on Devils Lake to the south of Devils Lake, North Dakota. The park consists of one park, Grahams Island, and one recreation area, Black Tiger Bay, totaling 1,122 acres (5 km) of land, and 107 camp sites. The Dakota Zoo is a zoo in Bismarck, North Dakota located on the banks of the Missouri River, it is the third zoo built in North Dakota. The Dakota Zoo is accredited by the Association of Zoos and Aquariums (AZA).